Upon arrival at Dublin International Airport, we will be welcomed and check-in to the hotel for an overnight stay. This morning visit Glenadalough, the ancient monastic city, founded by St Kevin and see the ruins of the Cathedral, Round Tower and “St Kevin’s Kitchen”. We continue to Kilkenny to visit the great 6th century Irish medieval Cathedral of St Canice and the Holy Cross Abbey home to the first relics of the True Cross. Our final destination for the day is a visit to the 12th Century “Rock of Cashel,” consisting of Cathedral, the Round Tower and Cormac Chapel, where St. Patrick baptized King Aengus in 450 AD. Today we attempt the magical kissing of the Blarney Stone atop its castle for the gift of eloquent speech. Drive to the city of Limerick that beckons us to see the 12th century St Mary’s Cathedral and the Friary at Ennis to celebrate Mass at the Church of Ss. Peter & Paul. Enjoy a scenic drive before we stop at the Cliffs of Moher which has 600 feet drop to the water below and the medieval charm in the colourful streets in the city of Galway. Visit the Clonmacnoise, which is Ireland’s leading monastic location, overlooking the River Shannon. This location was founded by St Ciaran and contains numerous early churches, high crosses, round towers and graves. Spend the afternoon relaxing on a Cruise on Corrib Lake as we explore Galway further. Enjoy the rest of the day shopping or resting before a picturesque dinner at the 16th century Dunguaire Castle. We start our day early as we drive towards Kylemore Abbey to see the convent of the Benedictine Nuns of Ypres. We proceed to the Mt Croagh Patrick, foot of which St Patrick fasted and prayed for 40 days in the year to banish all the snakes from Ireland. We continue to visit Ballintubber Abbey, where we celebrate Mass which is a daily occurrence for over 800 years. Here is a well where Patrick baptized people next to which is a rock with the saint’s knee imprint! Later during the day, we visit the famous Marian apparition shrine in Knock. This morning we drive to Drumcliffe, where St Columba established a monastic community, and also visit the grave of W. B. Yeats, the famous Irish poet in a peaceful churchyard. Take a short boat trip to the island of Lough Derg, Ireland’s most ancient place of pilgrimage, and partake in the traditional pilgrims’ program of penance. (Subject to availability). 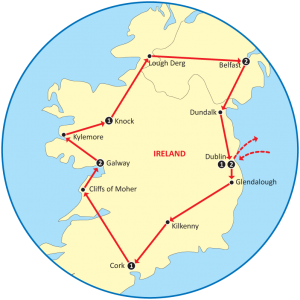 We will drive to Downpatrick, to see the grave of St Patrick at the Down Cathedral. Visit the St Patrick Centre to view the exhibition devoted to the saint, have the collections of art from the Early Christian period, as well as intriguing interactive displays. Later visit Armagh, the Ecclesiastical capital of Ireland we visit the Cathedral of St Patrick, built in approximately 444 AD. The Book of Armagh, which was written in the city, was also responsible for the spread of Christianity throughout Europe. Later this afternoon we take a panoramic tour of this fascinating city of Belfast and visit “Titanic Belfast”, an amazing site where the Titanic was built, exploring the Titanic story. Our day begins with Newry where we see The Cathedral of St Patrick and St Colman, the first to be built in Ireland after the Reformation. Continue to the town of Carlingford, Ireland’s foremost medieval towns to visit the fortified Dominican Friary. Proceed to Faughart to visit the Shrine of St Brigid. The Shrine marks the reputed birthplace of St. Brigid. Proceed to the Abbey of Mellifont, founded in 1142 as the mother house of the Cistercians. Later arrive at Drogheda, and visit the preserved head of St Oliver Plunkett on display in St Peter’s Church. Proceed to Oldbridge, to visit the Battle of Boyne Visitor Centre where Protestant King William III defeated the forces of deposed Catholic King James II and ensured the continuation of protestant supremacy in Ireland. We conclude the day with a visit to the Hill of Slane, where St Patrick lit a Paschal fire on the Hill. This morning we will have a panoramic tour of Dublin city seeing the statue lined O’Connell Street and some of the elegant Georgian Squares. Proceed to visit the St Patrick Cathedral dating from 450A.D. and see the Trinity College Library, established in 1592 that holding over 20,000 manuscripts, amongst the Book of Kells, a 9th century manuscript. We will conclude the day with a visit to the Shrine of St Valentine, after whom the February 14 holiday is termed. After breakfast, we will check out from the hotel and then transfer to Dublin International Airport for our return flight to Australia.